Bryan Low, a long-time analyst of the cross-border life insurance industry, has issued a stark warning about the potential for a precipitous decline in unit-linked life insurance product sales in two key Asian markets to spread, as the conditions that are seen to have caused that collapse are recreated elsewhere. Low, a co-founder and director of the recently-launched international product distribution company known as Provisca, said the key factor underlying this slump has been recent and dramatic regulatory changes in the two jurisdictions he studied – Hong Kong and Singapore – which he says “[have impacted] on the advice process, adviser remuneration and product structures” in both markets. “Sales of unit-linked savings and investment life policies in Hong Kong in particular have been decimated, falling by a whopping 89% across the last five years,” Low, who until last years spent a decade and a half as a cross-border life insurance industry consultant, added. This fall in sales occurred “in direct contrast to Asia’s continued economic prosperity” during the same period, and also took place “in spite of extensive efforts by major multi-national life companies to have locally authorised products in these markets and to promote them on a fully-regulated basis”, Low added. 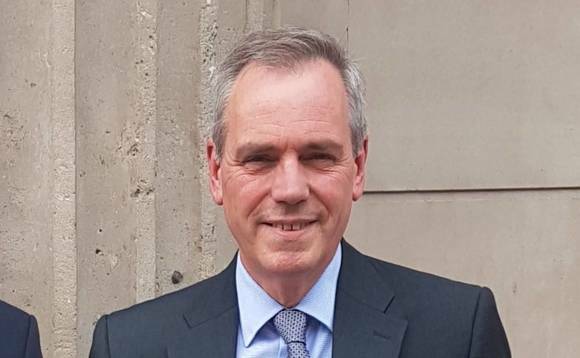 He warned that the next jurisdiction where this type of fall in sales is likely to be played out will be the United Arab Emirates, where “the regulator’s initial proposals suggest a Hong Kong-style scenario that would have a significant impact on advisers’ use of unit-linked linked life products, and therefore, on many advisers’ traditional business models”. As for the life insurance companies currently active in that market without a local licence, the impact is likely to be “even more profound”. According to Low, Hong Kong was at one time considered the “jewel in the crown of offshore life sales”, and as recently as 2012 posted a new business Annual Premium Equivalent (APE) in unit-linked products of more than HK$10bn (£1.0bn, US$1.3bn). Regular premium savings products, which traditionally have generated the majority of sales that critics have claimed were fuelled by high initial commissions, fell by 52% in 2016 to just HK$661m, Low noted. This, he said, marked a decline of 93% from 2012’s heights of HK$9.7bn, “with the sharpest falls following the introduction of the GN15 rules on sales of ILAS (investment-linked assurance products) at the start of 2015”. Hong Kong’s single premium new business has suffered a less dramatic decline over the past four years, Low notes, although 2016’s HK$507m APE was still a chunky 31% down from 2015, and 59% down from 2013. As in Hong Kong, Singapore’s insurance sales have been impacted by a package of new regulations that have been brought in recently, known as the Financial Advisory Industry Review, Low said. However, thus far at least, the declines haven’t been quite as precipitous in Hong Kong, as the regulatory changes have had less impact on the sales process, as they haven’t addressed key issues around the payment of high commissions to advisers. 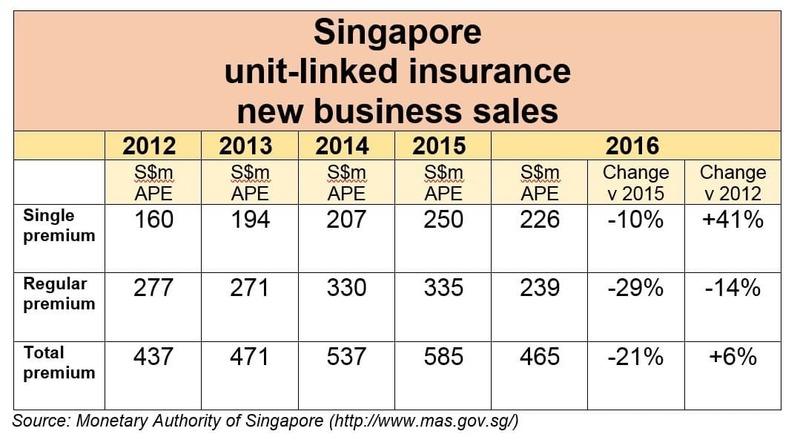 Here, unit-linked life insurance sales slid by 21% in 2016 compared with the previous year, according to Low, who cited Monetary Authority of Singapore data, as total premiums hit just S$465m APE (£267.2m, US$332.44m), down from S$585m in 2015, and “ending the steady growth seen in recent years and reducing the five-year growth figure to only 6%”. What this means for those in the business of selling unit-linked life insurance products in other jurisdictions that have yet to undergo regulatory changes that force the disclosure and capping of product commission, Low said, is that they and their jurisdictional colleagues may be next to suffer such sales declines. “The Hong Kong and Singapore new business figures for 2016 suggest that unit-linked life sales will decline rapidly in jurisdictions where regulators act to deliver better outcomes for customers,” Low said. “New business levels of traditional life company savings and investment products will fall in direct correlation to the extent of the changes imposed by individual regulators to increase product transparency and disclosure, and to restrict the commissions that advisers can take from products and funds (or ultimately, to ban commissions in favour of fees). For advisers who face such changes to their traditional use of life products to hold their clients’ savings and investments, Low noted, there is at least one alternative option: platforms. “Modern, multi-currency investment platforms now offer a secure online alternative to traditional unit-linked life products, enabling advisers and their clients to access a huge choice of funds, without the cost of an often unnecessary life insurance wrapper,” he said. One Hong Kong advisory firm apparently reached the same conclusion as Low, with respect to the potential opportunities of platforms, last year. As reported in November, Hong Kong’s listed Convoy Global acquired a £24m (US$30.2m, €27.8m) stake in the UK B2C platform company Nutmeg, as part of what it said at the time was an ongoing evolution of its business model. The wealth manager, which lays claim to being Hong Kong’s largest advisory firm, reported a loss of HK$467.26m (US$60.25m, £48.4m) in the year to the end of 2015, compared with a net profit the previous year of HK$246.17m (US$31.74m, £25.51m). In its year-end statement, the company attributed the loss to “the economic downturn and volatile stock market” that occurred in the latter part of last year, as well as to “the regulatory changes in [the] ILAS [investment-linked assurance schemes]” market. Also betting on a platform future for international life insurance products is the Isle of Man-based RL360° life insurance products group, which last year acquired Ardan International, the international platform business, from Rowan Dartington, also based in the IoM. Ardan is one of the market’s few independent wealth platforms designed specifically to be used by financial advisers with expatriate clients, and features such international-client-friendly advantages as a multi-currency facility.